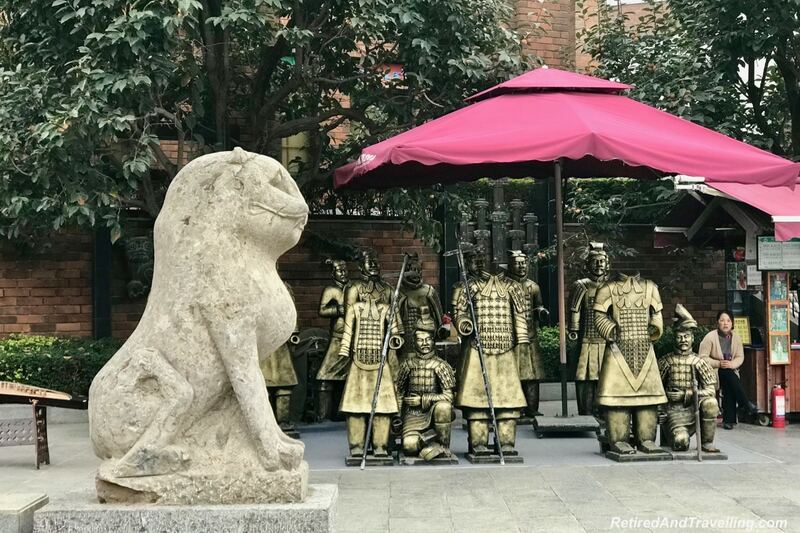 On our month long visit to China, we checked off so many travel wish list items. On this stop to stay in Xian, we got one more. 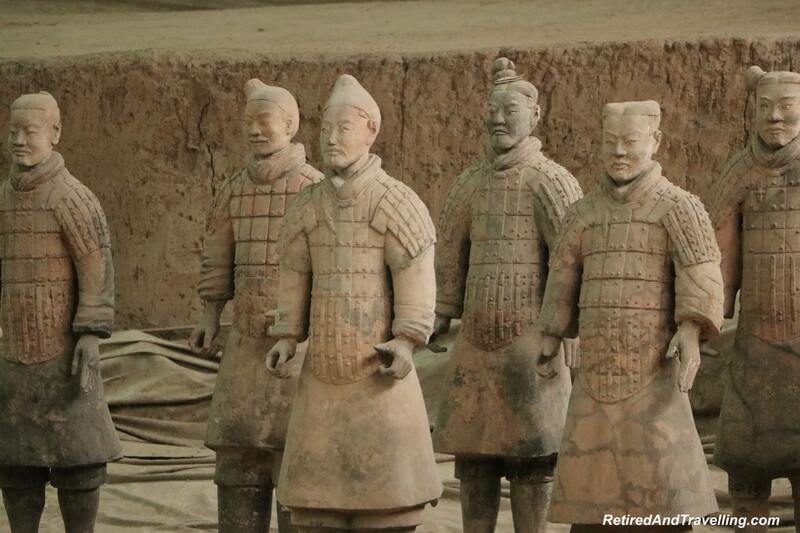 It was so amazing to see the Terra Cotta Warriors in Xian China. 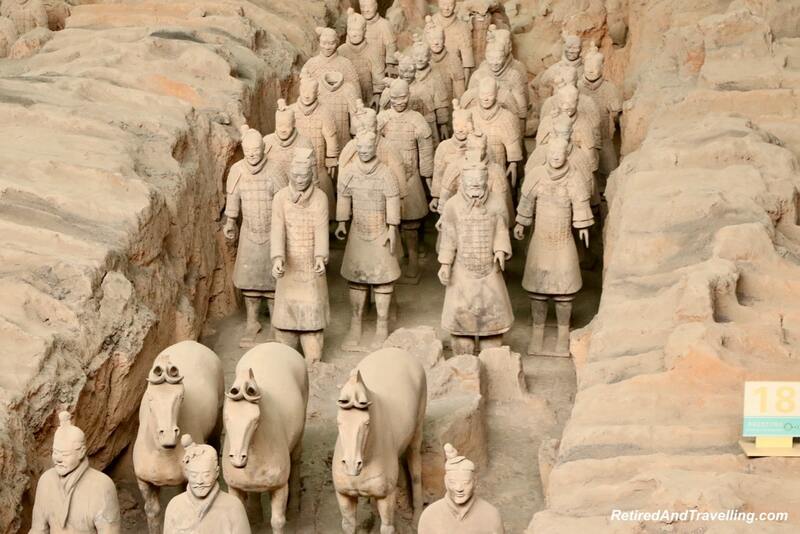 The Terra Cotta Warriors are a massive collection of life-sized statues of troops, horses and chariots. 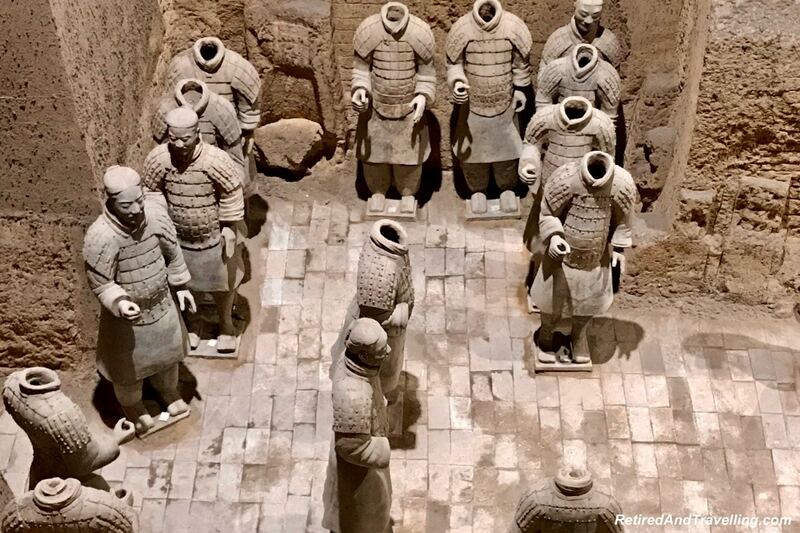 They represented the imperial guard troops of Emperor Qin Shi Huang (259 – 210BC) and were placed to guard him in the afterworld. 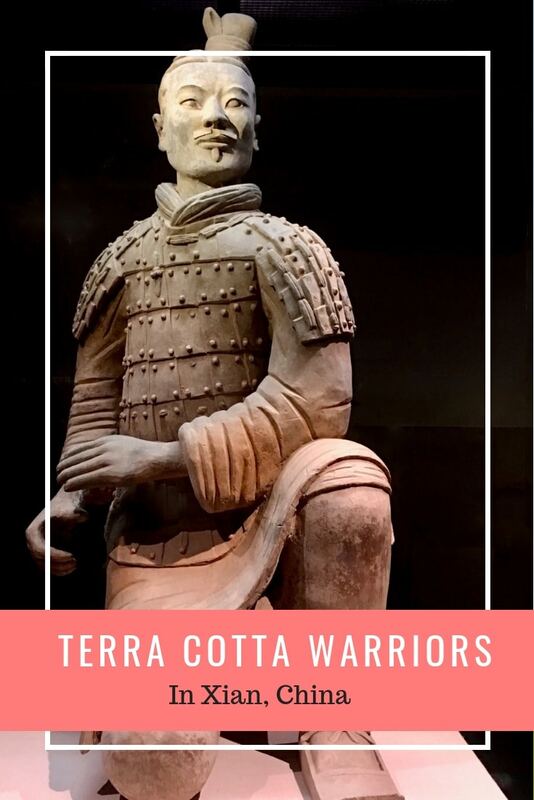 The first pieces of a Terra Cotta Warrior were discovered when a farmer was digging in his fields in 1974. He notified the government and they sent archeologists in. Since that time, the huge area is slowly being uncovered. We were able to see several of the pits but so much more remains buried. We headed off early on our visit to Xian. 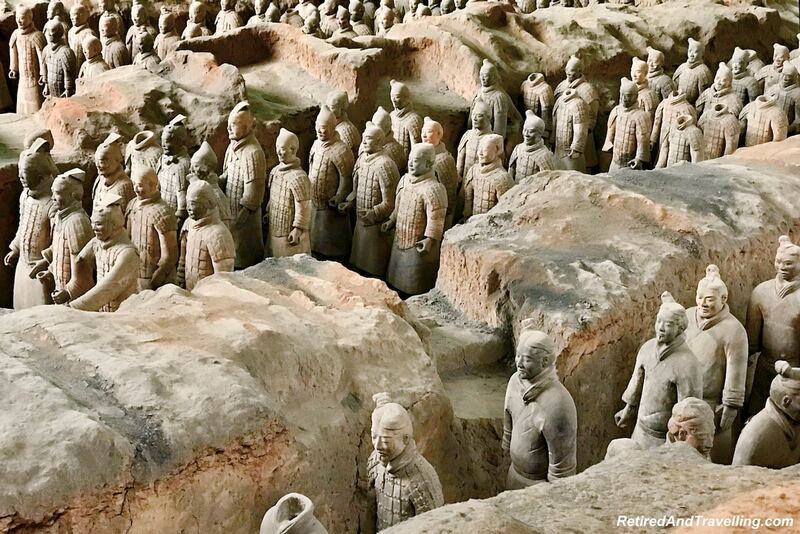 The Terra Cotta Warriors were located close to the tomb of the First Qin Emperor. While the location of this tomb is known, the government is concerned about damaging the contents if the tomb is opened. So for now, it remains sealed. 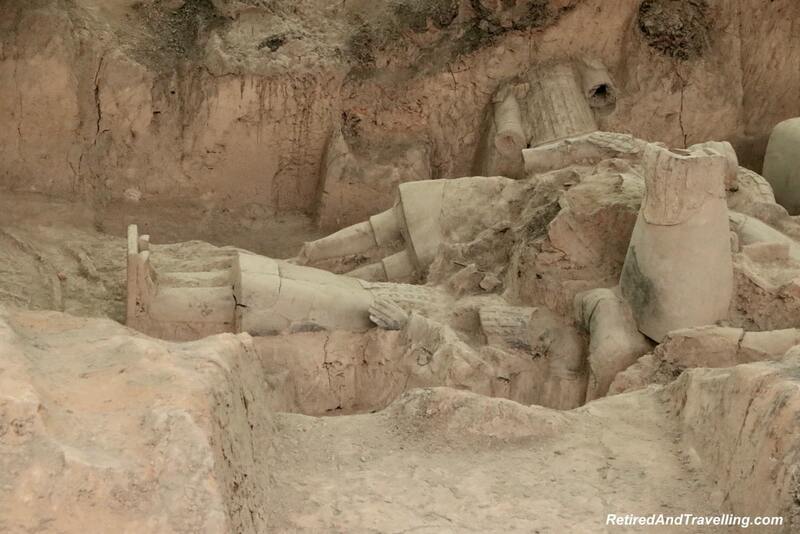 We were told that there are many other Tang and Han tombs in the hills around Xian. Some can be toured. We entered the site by the large statue. Golf carts took us to the pavilions. 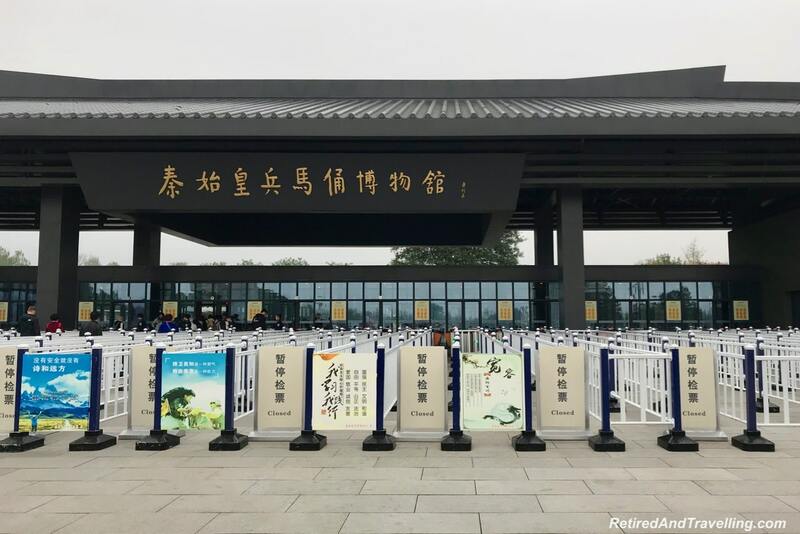 The queue area to visit the Terra Cotta Warriors wound over and back dozens of times. But thanks to our early start, we walked straight in. We started our visit at the first large excavation site at Pit 1. There are four pits open to the public at this time. We started in Pit 1. This is the largest pit, about the size of two football fields. The military formation in this pit shows chariots and infantry. 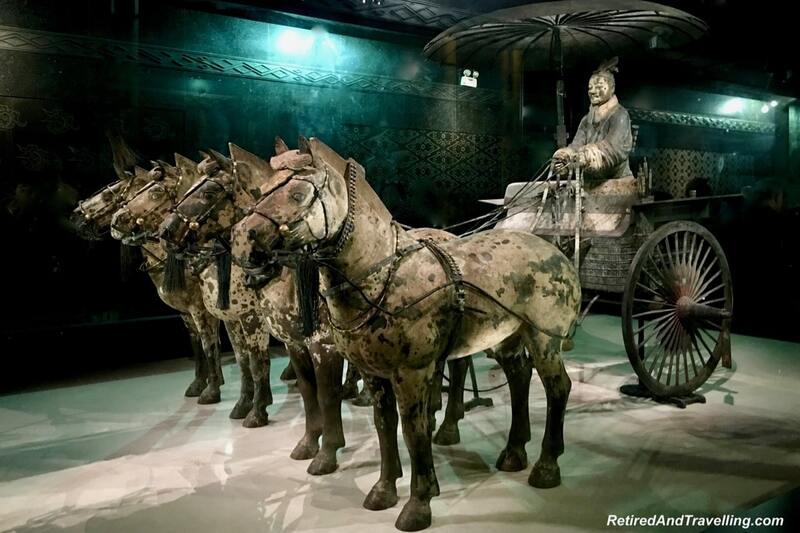 Over 6,000 individual figures and 50 chariots were once in this area. Our first pause point inside of Pit 1 gave us our first visit of how massive the whole site must be. We looked down and saw rows after rows of warriors lined up on the brick roads. It was hard to believe that each statue was life sized! In a few places we saw horses. At one point these horses had pulled chariots. But the wooden chariots have long since deteriorated. The empty hands of the warriors also once held the reins or different weapons. When we looked close, it was clear to see that the statues had unique faces. 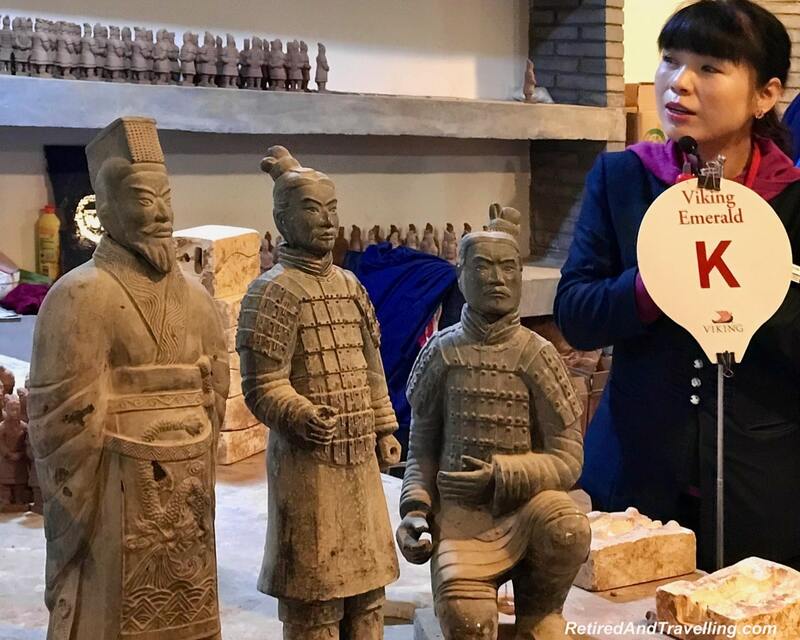 The facial shapes of the terracotta figures can be roughly classified into eight types, and each shape resembled a Chinese character. Their hairstyles and clothing reflected their rank. 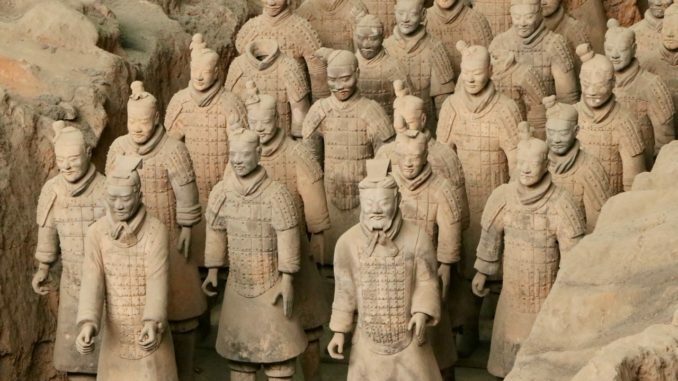 Most of the warriors were a reddish colour that we associate with terra cotta. But in places you could see remnants of colour. We walked around the perimeter of the dig site. We saw the archeologists at work uncovering more of the statues. At the back there was a “hospital” that was used to put the pieces that were found back together. Our first view of the Terra Cotta Warriors in Xian was such a fantastic and awe inspiring sight. Our second stop was in Pit 2. This was the headquarters area. It was seriously destroyed at one time and only 68 pottery figures, one chariot and 34 bronze weapons were unearthed in this pit. Most of the statues are still in pieces. We stopped then at Pit 3. This covers half size of the area of the Pit 1. This pit has the most army units with chariots, infantry, cavalry, and archers. The area includes rows of kneeling and standing archers. Many of the heads were missing from the statues. We learned that the statues were made with the heads a separate piece, so they more easily have been separated from the bodies. 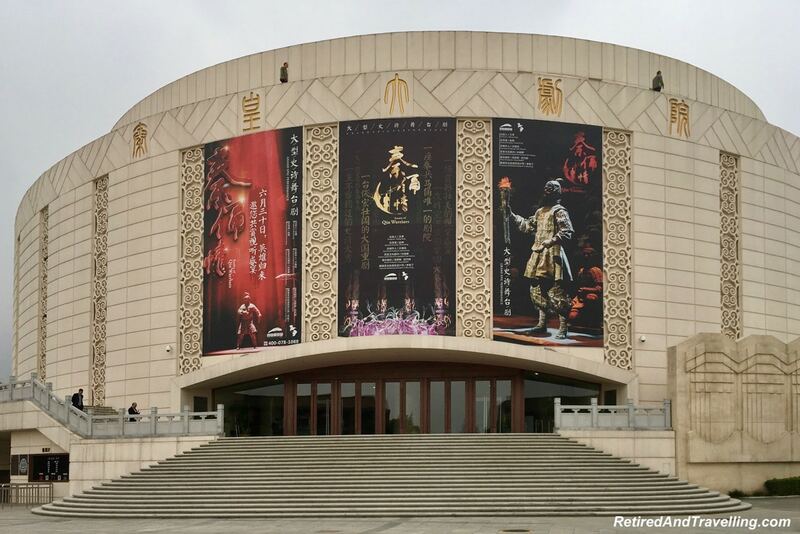 In this building, we also saw the Terra Cotta Warriors that have been restored and have travelled as exhibits to other countries. We saw the standing and seated archers. As well as various ranks of officers. 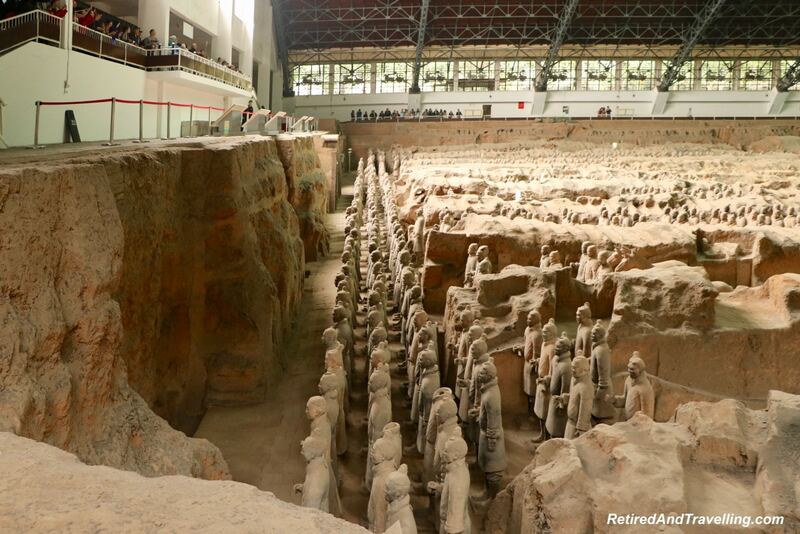 It was fascinating to see so many of the archeological sites for the Terra Cotta Warriors in Xian. We had time for one quick stop at the museum. We went down the stairs behind the massive UNESCO sign to find the bronze chariots and horses. Around the walls there were stone carvings that showed chariots and horses in action. Encased in glass we found two different styles of chariot, each driven by four horses. This was a great way to finish our visit to see the Terra Cotta Warriors in Xian. But on the way out we walked there a massive area of stalls selling everything under the sun. It seemed to be a large art and entertainment area. There was even a large theatre. We stopped by the stone wall relief of the Great Wall of China. 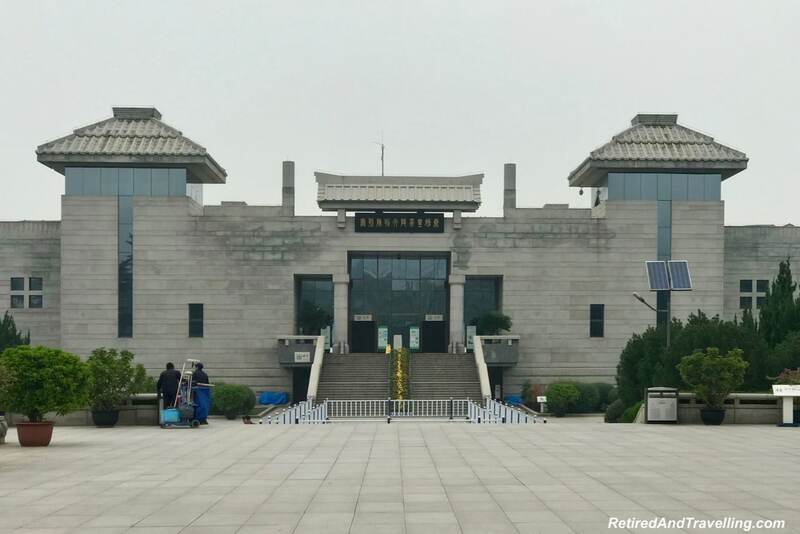 This gave us a preview of this iconic Chinese site we visited in Beijing. 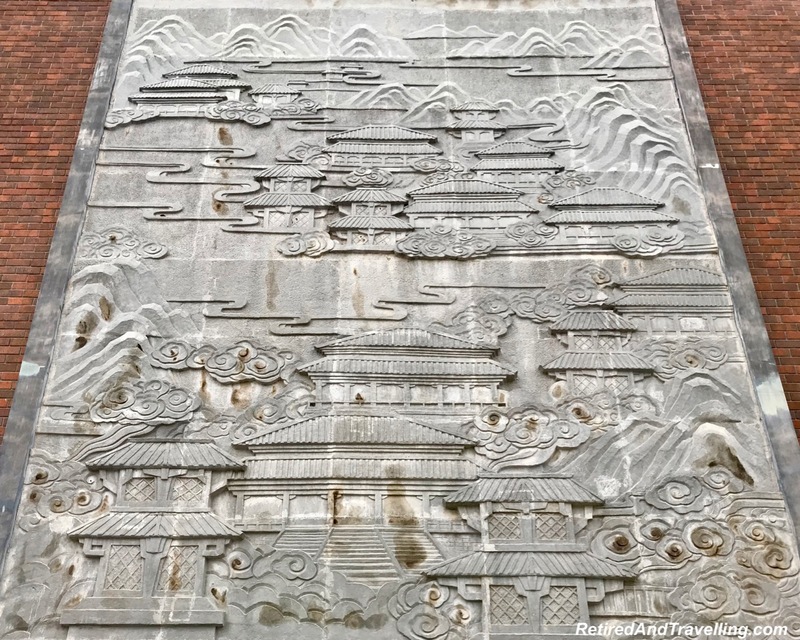 There is certainly a lot to see and do when you visit the Terra Cotta Warriors in Xian. We walked over 10,000 steps on our visit to see the Terra Cotta Warriors in Xian. But we were not released for lunch until after our shopping stop. 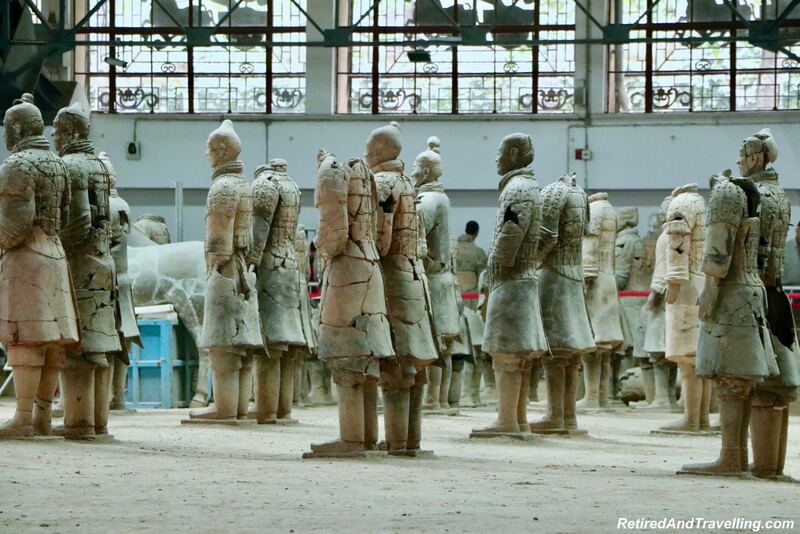 We started with a demonstration of how the Terra Cotta Warriors had been built with hollow bodies and separate heads. 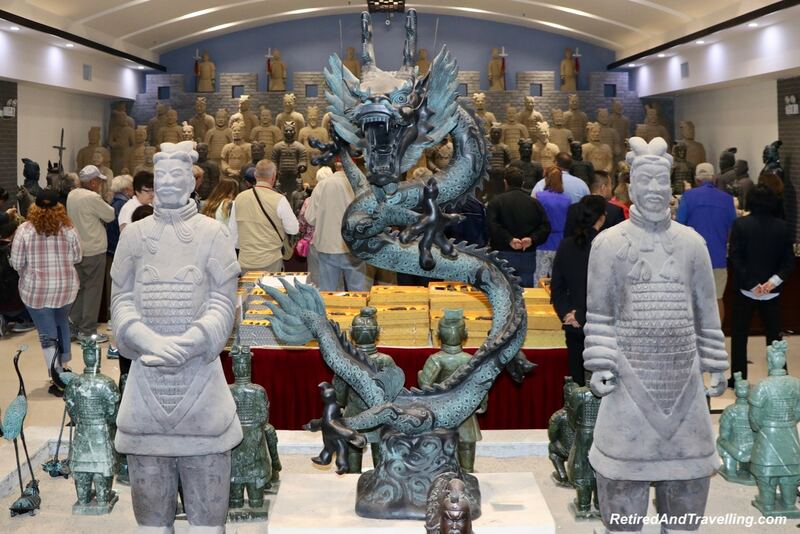 The medium and large Terra Cotta warriors for sale were made in this historical manner. Small ones were created from molds. It was interesting to see the bright colours on the small warriors. Since the paint was all gone from the ones in the pits. 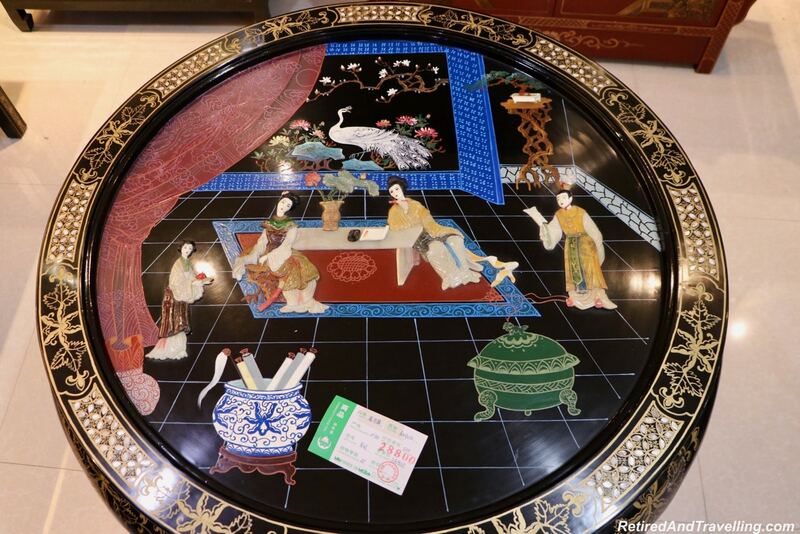 We moved from the large display of warriors for sale to see the lacquer work. 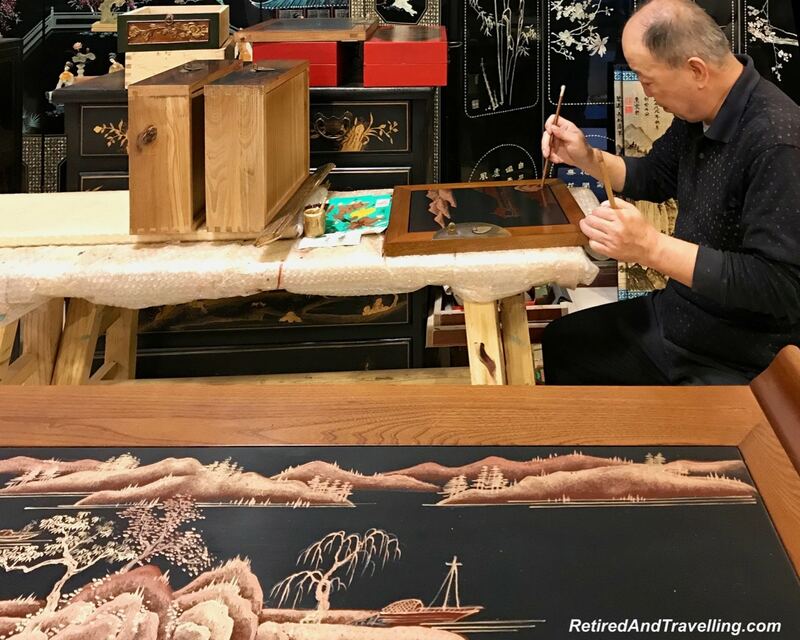 We watched a man working on the panels for a lacquer chest. The pieces we saw represented several different styles. 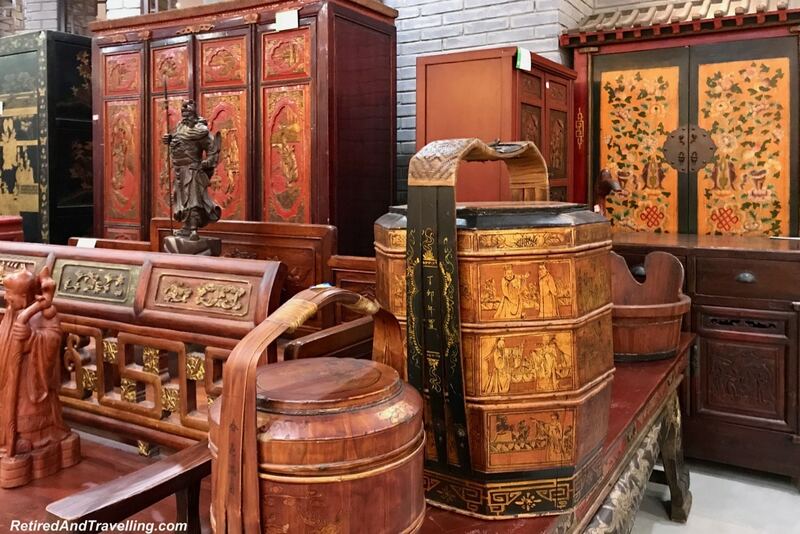 The final part of our shopping tour took us through to see several rooms of Chinese furniture. While it was quite beautiful and interesting, at this point I just wanted lunch. After we had yet another buffet Chinese meal, we had almost an hour for shopping. Lots of people left with souvenirs of our great day visit to see the Terra Cotta Warriors in Xian. 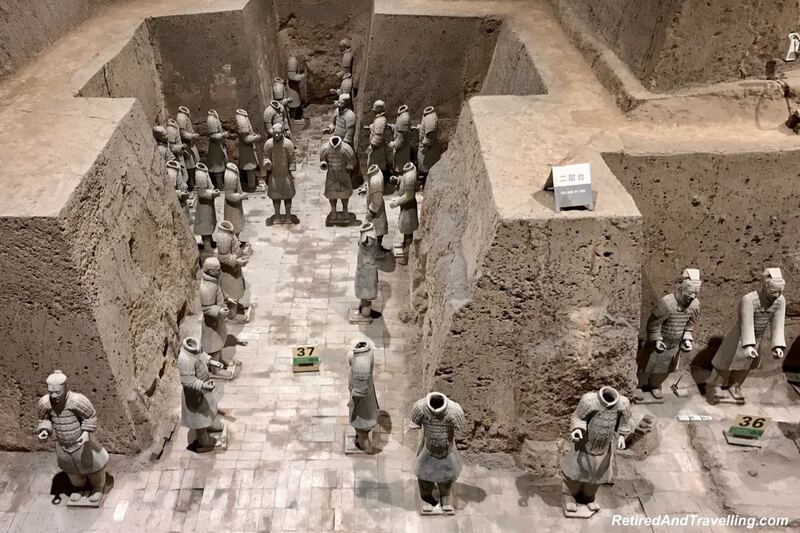 We were so glad we got to see the Terra Cotta Warriors in Xian. This is one of those iconic Chinese sites that you really have to see to believe. 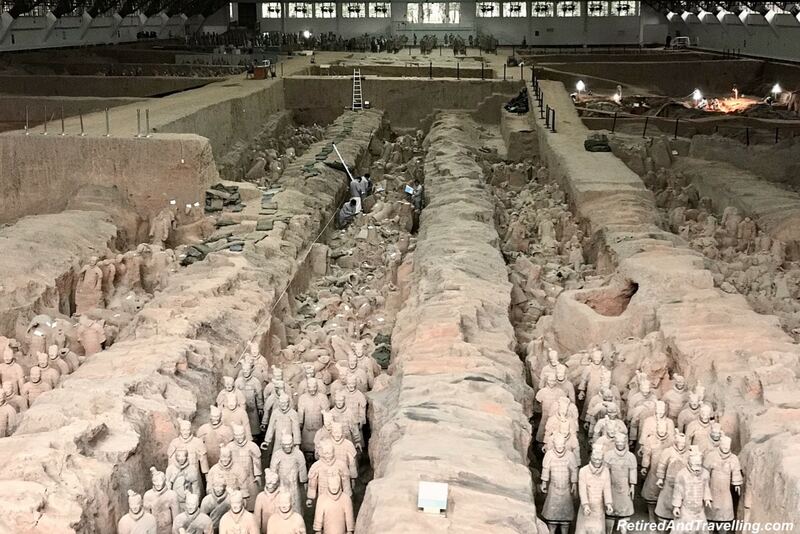 While you may have seen the travelling Terra Cotta Warrior exhibits, that does not prepare you for the site of rows after rows of statues. It was truly an amazing experience. Each year, more and more is unearthed. They are moving cautiously. A lot of work is being done on methods to preserve the site as it is uncovered. Every year this site will get more and more fascinating. But there is so much to see already. 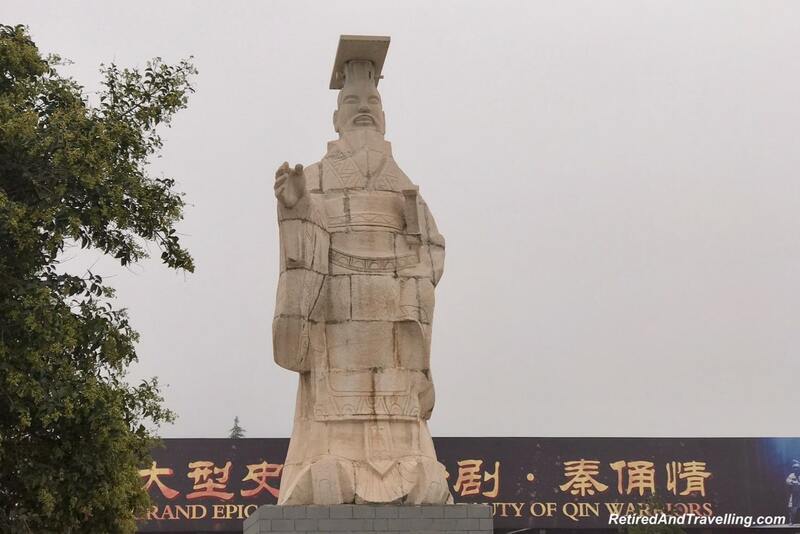 When you visit Xian, don’t miss a chance to visit the Terra Cotta Warriors. 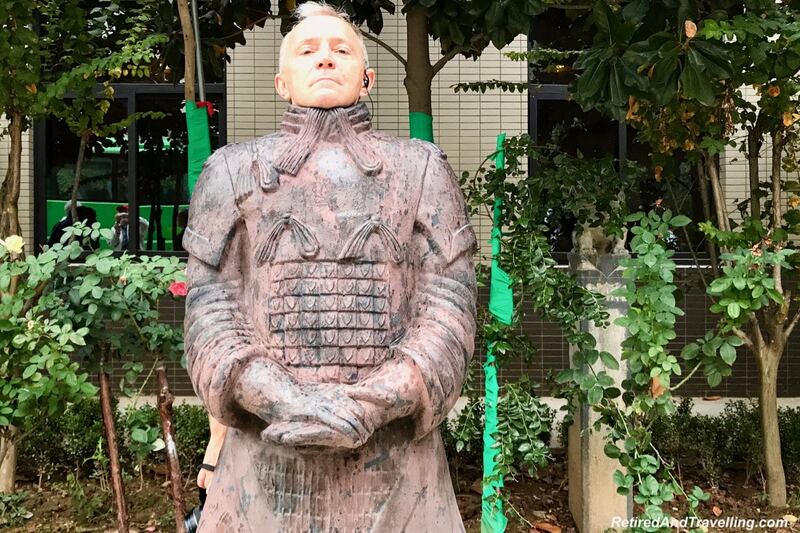 It was one of the treats on our 4 week visit to China. 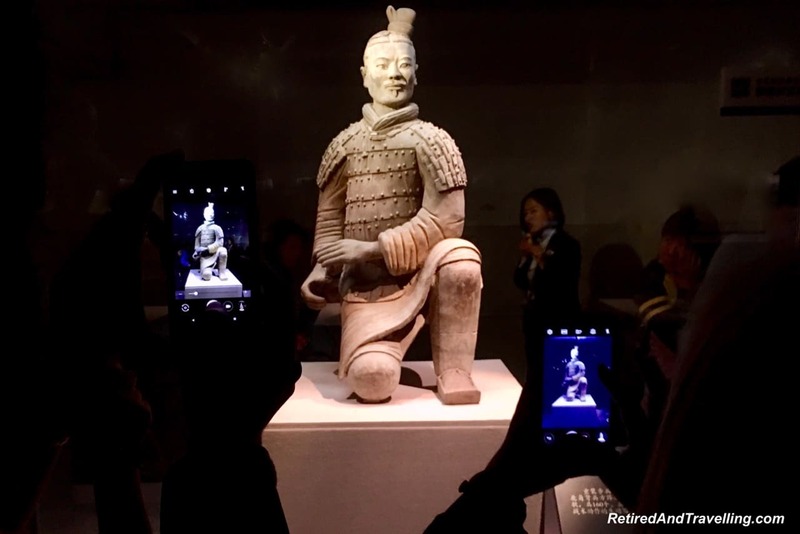 Did you see the Terra Cotta Warriors In Xian? Can you imagine how awesome this will be when all is uncovered? I still cant believe this place exsists. I would love to know the feelings and the look of the persons face on who discovered these statues. Cant wait to get to Xian to check this place out. Been to China a few times but not this region. Great write up and love seeing different photos from around the building. 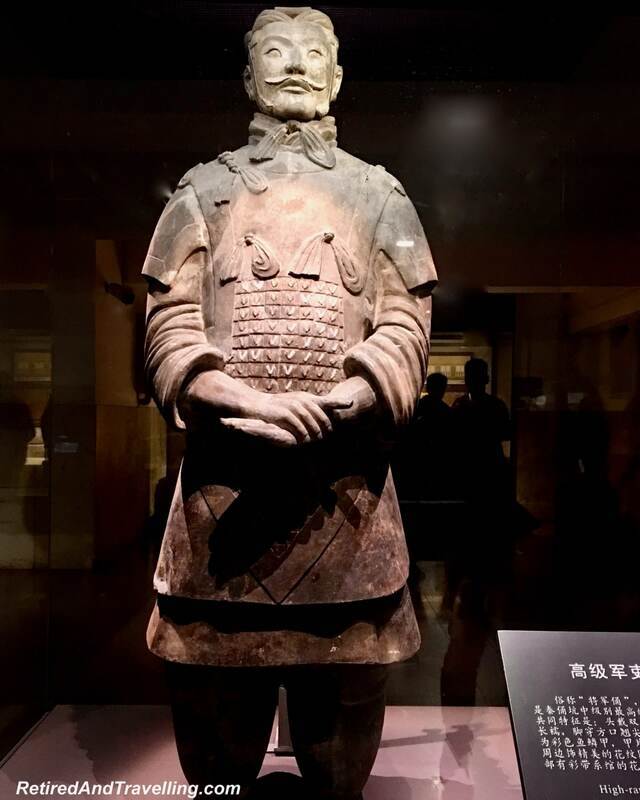 I have read so much of terra cotta warriors in China. One thing that really got me interested is that they say there’s no two statues that look like. Is that true? Whoever who did this is truly a genius! Wow. 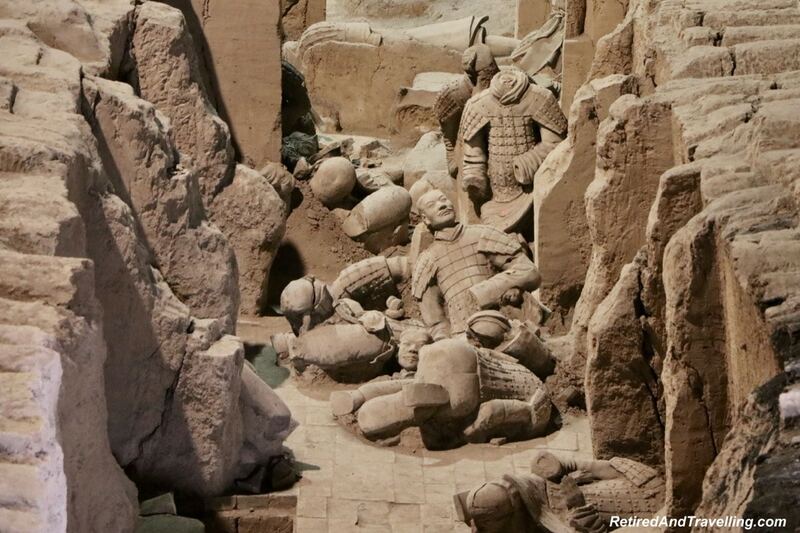 Seeing the Terra Cotta warriors is definitely on my to-do list. Pit 1 is massive indeed. I can’t imagine what it takes to produce 6000 warriors and 50 chariots! It’s interesting to see the excavation work in progress. I’m surprised to learn that the heads were made separately from the body. I’ve always assumed they were made as one piece. 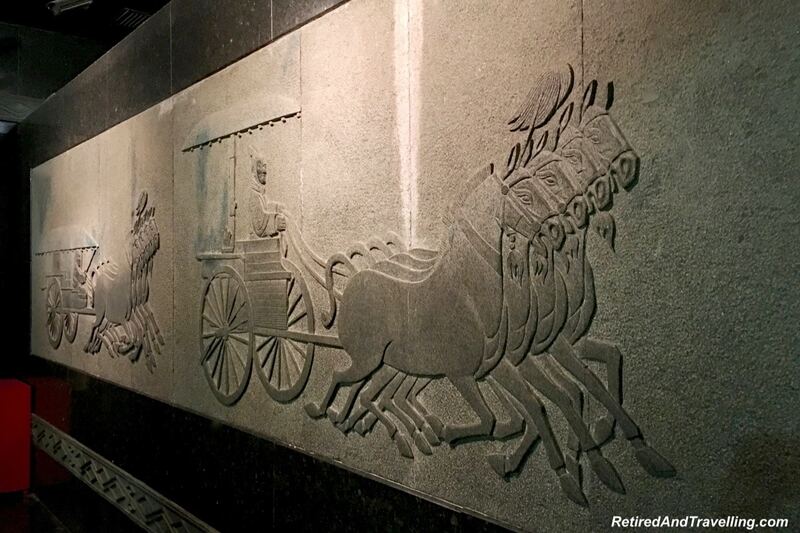 The stone carvings, which show chariots and horses in action are impressive too. 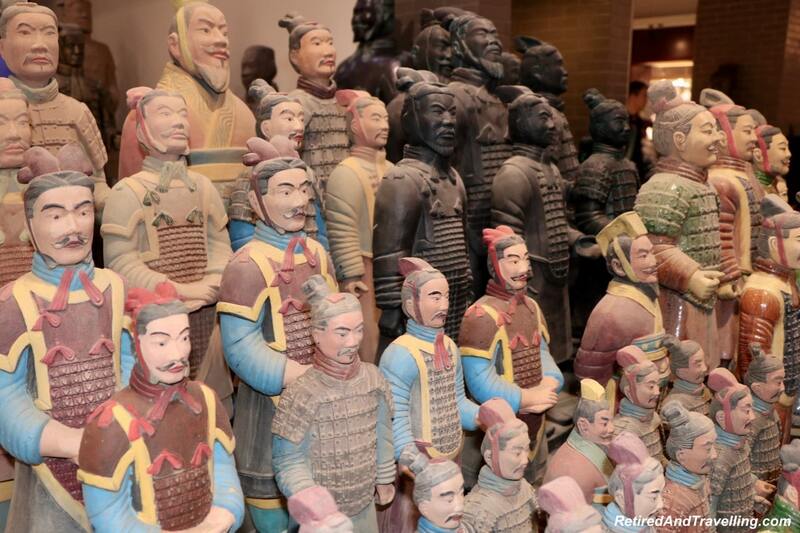 The Terra Cotta warriors are an unbelievable sight! They are world famous but the sheer number of the statues and the grandeur of all of them so close together doesn’t really hit you unless you see them up close and personal. Or as up close as you can get from the guard rails! 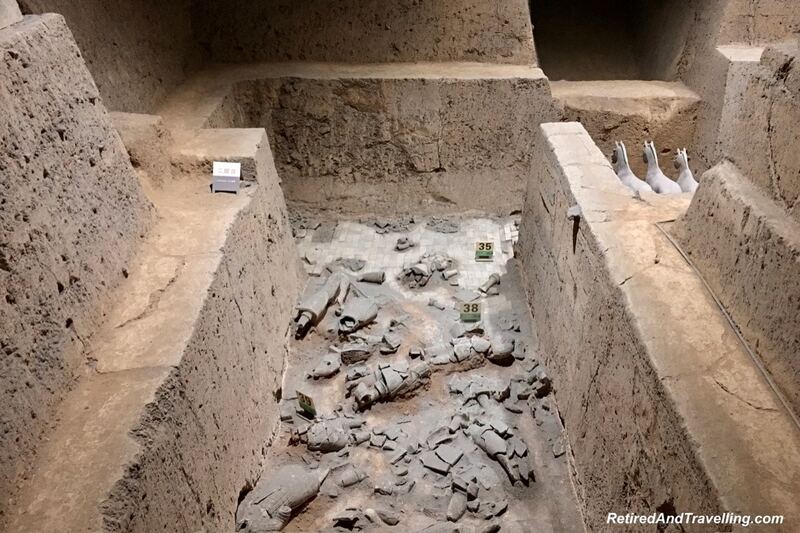 It’s amazing to see that they are still excavating more and more warriors out of the ground. 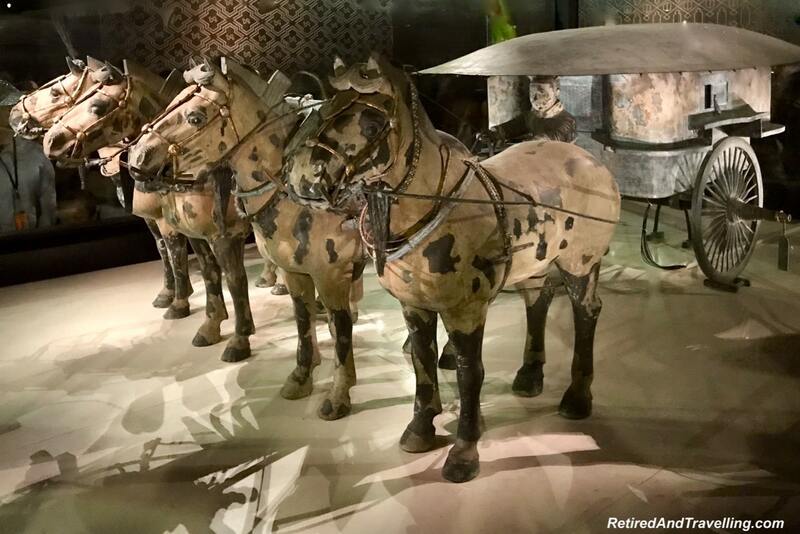 I was curious why the soldiers behind the horses were holding their arms so strangely, I had no idea they were holding onto chariot reins that rotted long ago. Thanks for sharing! 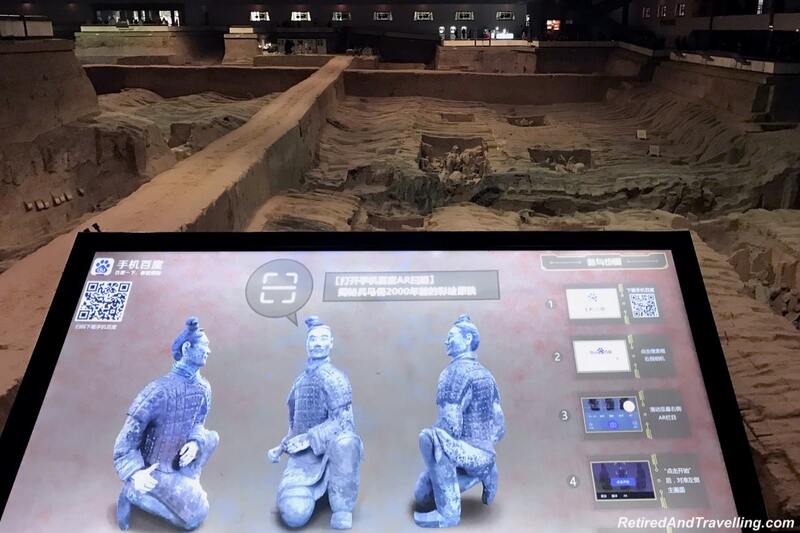 I totally agree that the Terra Cotta Warriors were such a delight to see. It’s amazing to me that they survived as long as they did and that the archeologists can put them back together so well. They have a very long way to go though. I had no idea before we went that they would be so big or that the area would be so incredibly huge. Such an impressive place. I remember reading about them when I was a kid in school. I would love to see this in person. Wow they have left that particular tomb sealed too. Makes for great curiosity. Pretty cool how it was just accidentally found by a farmer and how much has been uncovered. Wow it must be mind blowing to see so many of those warriors together! 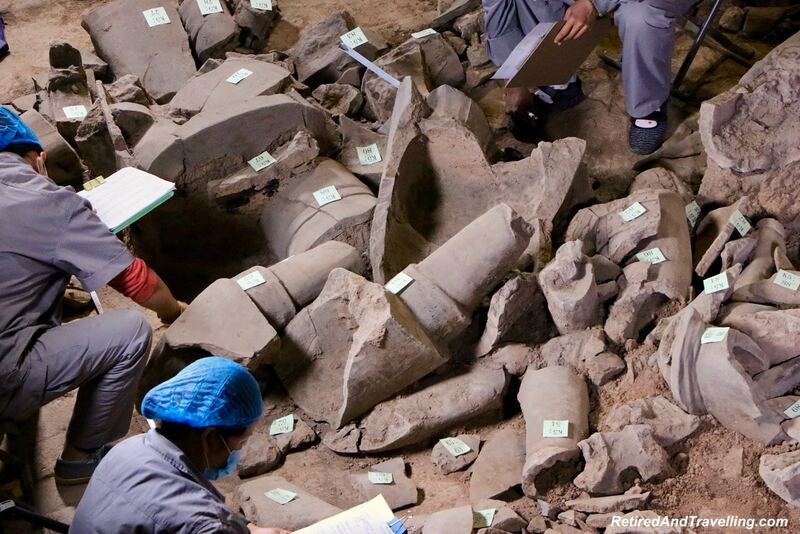 Interesting to note that archeologists are at work, wonder what more will pop out! GOSH ! I am so so envious of you. I have been wanting to see this for myself. 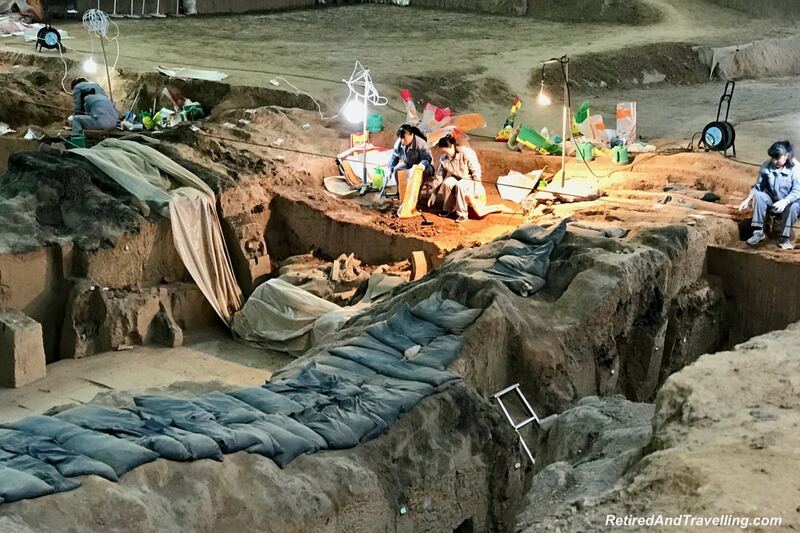 Thanks for such a detailed post for I always wondered how and what and where….the whole pit scenario, the details of the soldiers – -…on foot, horse etc. WOW. Loved this post. 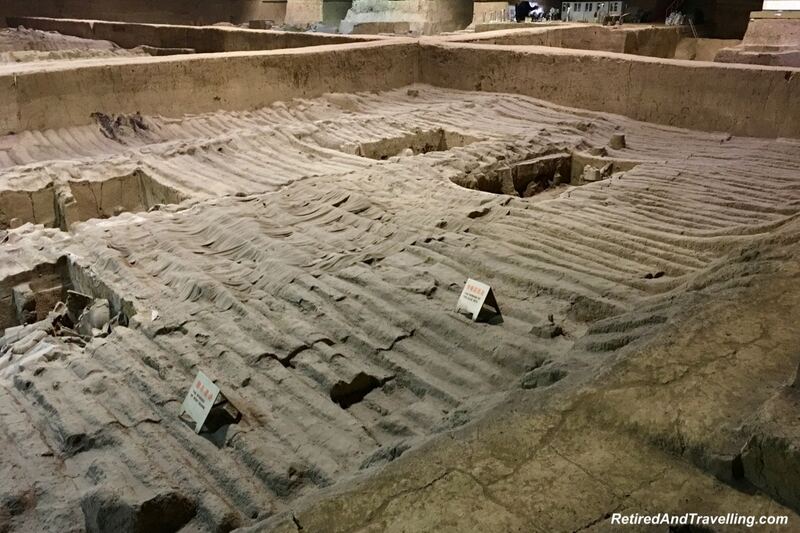 Wow, the excavation site looks amazing! 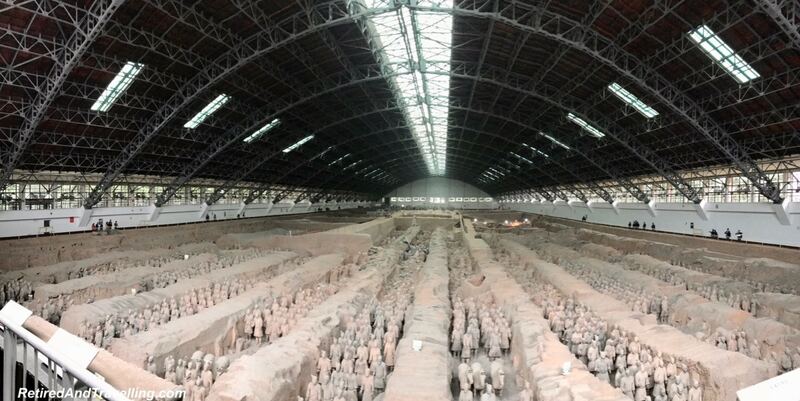 So intriguing to see the people at work and so many statues in Pit 1, such a huge area indeed. The statues with their heads separated look almost a little gory! 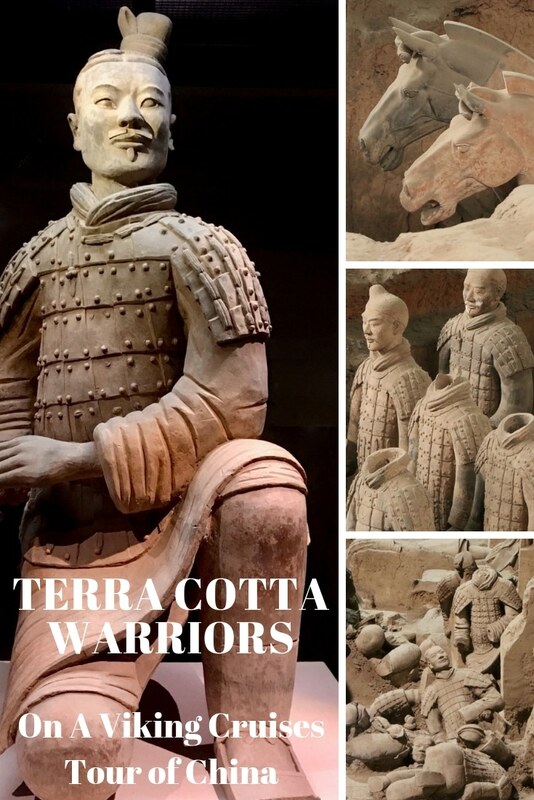 I’d love to visit the Tera Cotta Warriors in Xian, whenever I make it there! Must have been great experience. We had in Finland few years ago an incredible exhibition about these. Thank You sharing Your photos.